To use measure apps apple didn’t declare any weather conditions but sometimes users facing issues like this. Here is Jay and I am sharing pro tips that help to measure distance and find the Object correctly and easily. In Future, Apple will add new features and options in AR based app. So, let’s get started and Enjoy new Measure apps in iOS 12 or later iPhone, iPad, and iPod touch Devices. Measure app is free; It can be deleted from iPhone and Re-download from the app store in free if your iOS is updated with the latest version. Measure app is not detecting the object and set starting point. See the Video to learn a quick and correct way to measure object length and width. Also Force close Measure app while not in use, You could do that in the case of Lagging, Freezing and Crashing while in use. Don’t Waste time to measure object, be an expert. My iPhone Gets too hot while using Measure apps on iPhone and Measuring object. Darkroom or low light is not an issue, Keep light at least object will see you with your eyes. 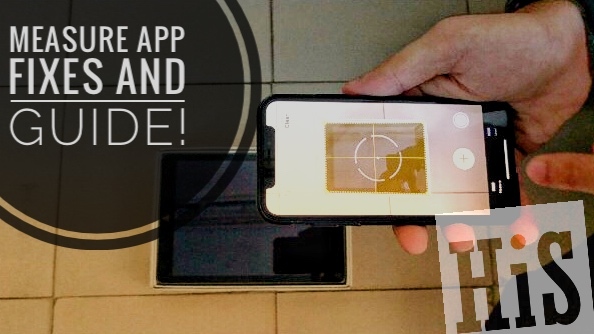 Now, Take away your iPhone close to object area so iPhone’s Lens can find the object and gives a starting point. Sometime Measure apps don’t focus and identifying object in sunlight. Keep your iPhone’s camera lens angle on opposite side of the sunlight rays. Whatever the reasons, you can get back measure app on your iPhone using the guide given in my past article: Measure app missing or unable to find. Restore iPhone using iTunes without losing that data. Restore iOS in recovery mode to the latest version on iPhone/iPad. Connect your iPhone and iPad to iTunes via lightning cable. Unlock your iPhone to Sync & Detect iPhone on iTunes. iTunes will Take Backup on Mac automatically. Now Quit iTunes. Press and Quickly Release Volume up button, Press and Quickly Release Volume Down button. Now only Press and Hold Side button or Power Button until you see the apple logo on the screen. Also Keep your eyes on iPhone Screen, Your iPhone screen is Black and Showing Lighting connector & iTunes. The iPhone is in recovery mode or DFU mode. Now open iTunes on Mac. 4. Now, You will see iTunes prompt that has two options, One is Update and Another is to restore. Go with Update to install the new copy of iOS on your iPhone X without lost or Wipe data. You can’t catch your iPhone X in recovery mode, Repeat the steps 3 until you see iPhone in recovery mode. Sit back until you see the screen like new iPhone. Use iTunes to set up your iPhone, Because iTunes will restore all the data back to iPhone X. Note: You are stuck and unable to get out from recovery mode, So disconnect your iPhone from Mac computer. Use Side button to reboot iPhone. Now Enjoy the Measure app [it’s Built-in app comes with new iOS firmware]. Hope you get help from us, Would you like to share any idea on behalf of this problems. Kindly touch with us via comment box or On Our social pages: Facebook, Twitter or Google Plus, Subscribe us & YouTube. Previous Play iTunes & Apple Music on Any Device? Remove DRM Restriction Right Away!